As far as the house situation goes, we are good to go! We got a call on Saturday night that our buyer decided NOT to re-test; she is going to “chance” it and move in anyway! Is that not craziness?! I said to Chris, “It’s literally like God is moving her right into our house for us!” We are still scheduled to close on the 29th. More good news is that our attorney’s office called, and they’re fed-exing (yeah spell-check does not like my new word) the documents to us this week. All we have to do is sign them in front of a notary, fed-ex them back, and we don’t even have to attend closing! This is also wonderful news because the attorney’s office is nowhere near my in-laws; we were either going to have to pray Luke survived a good hour or so in the offices or leave him with my in-laws and drive in the opposite direction to go back and pick him up. Speaking of weight, I told you all that I had a goal of 4 pounds lost by Thanksgiving. Well, as of today I’ve lost only 2.5. I got a really bad cold/sinus infection last week, and it’s still lingering. My ear is still blocked up pretty bad, so I’m not sure what I’m going to do about that. Anyway, all that to say that I did not do Zumba like I had planned, and I know that would have helped. My current goal is to just maintain my weight through this weekend (I have to survive TWO Thanksgiving meals!) and then start Zumba when I’m back and feel totally better. I can’t believe Thanksgiving is only two days away! It truly is my favorite day/weekend of the year. Thanksgiving for me involves watching the parade on tv with my sister, eating my mom’s delicious meal, then going to a big post-dinner party at a family friend’s house with a bunch of families I’ve known my whole life. We play games and eat desserts and it’s a lot of fun. The only early-morning line I stand in on Black Friday is the Goodwill line – our local Goodwill has 50% off EVERYTHING in the store that day! It is a madhouse but it is so much fun. Then we usually come home and help my parents decorate for Christmas. This year we’ll be hopping in the car on Friday night (so Luke will sleep), loading up the U-Haul in PA, and driving it back on Monday. We’ll celebrate Thanksgiving with Chris’s extended family on Saturday. It will be a whirlwind, but still so much fun. I won’t be posting again til next Tuesday because I’ll be so busy with everything. I want to thank those of you who have told me via comments or e-mail you’re praying – it means SO much to me! Have a WONDERFUL holiday, everyone! Hey everybody! Before I start on the list, I have two quick things to tell you: First of all, some of you may have noticed by now that my new blog design is up! It’s currently still under construction and we’re working out the kinks – I hope to have it perfected by next week! Second, I didn’t realize that the results I wrote about in my last post were going to take 3 whole days to come back, so I won't know until tomorrow or Monday! Ahhhh! I really appreciate those of you who prayed, though. Okay, well, on to the party! I know I haven’t posted a lot about clean eating lately, but let me tell you, these are two STAPLES in my house! I have tried a TON of natural peanut butters, and believe me when I tell you that is one is by far the best. I haven’t been able to find it here in CT, so I have to buy it in bulk when I go to PA! It.is.awesome. and totally worth looking into. 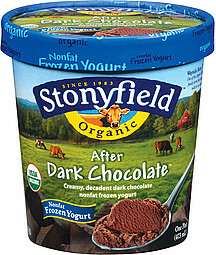 As far as Stonyfield goes, you know I try not to eat a lot of sugar, but I do make an exception for this frozen yogurt. On a normal day, I really try not to eat sugar in any other item besides fruit, milk products, a little honey, and maybe this. It is so, so creamy, and it honestly doesn’t have that usual frozen yogurt aftertaste. I highly recommend it! 2. St. Ives Timeless Skin Facial Moisturizer. I bought this a few weeks ago when Rite Aid was having a sale on it: buy it for $3.99, get $3 refund back. The thing I like most about it is that it’s paraben- and phthalate-free. I’ve been reading more and more about those chemicals, and they scare me – especially for something that’s going to sit on my face all night long! This is light and fresh feeling, and I’m pretty sure it’s going to last me until I have grandchildren. I posted about my Target kids’ boots find recently, and I honestly think they’re my favorite finds of the season. They’re comfy, cute, and SUPER AFFORDABLE! Totally great. 5. Starbuck’s Salted Caramel Hot Cocoa. Again, I’ve already posted about this drink, but I can’t sing its sweet-salty little praises enough. I’ve had a cold all week, but if I feel well enough tonight, Chris and I are going to Starbucks to get drinks and then finish picking out our Operation Christmas child presents together. Mmmmmmmmm. Rachel McAdams is one of my all-time favorite actresses, and two of her movies rank up there as some of my favorites. I love The Family Stone for so many reasons – it makes me cry and laugh, which pretty much guarantees I’m going to love a movie - but mainly because I want a big family and a big old beautiful rambling New England house like that one someday. It’s one of my most favorite holiday movies. 320 Sycamore is one of my MOST favorite blogs – be sure to check her out! Last Monday, we were told that all of our buyer’s inspections had passed with flying colors. On Wednesday, we were told that there had been a paper-work mix-up, and there was actually a biiiiig problem with one of the facets of our home. We traveled back to PA this weekend to pack up our entire house and to try to fix the problem. It is getting re-inspected tomorrow. If it doesn’t get fixed, we most likely won’t be able to close on the 29th. Honestly, I’m not sure what we’ll do if it doesn’t get fixed. If you know me in real life, please don’t mention this to my parents – I don’t want them to worry. The problem sounds very scary when you say it out loud! We need a miracle tomorrow - and most importantly that this inspector does a better job than we were told he did last time! I would so, so appreciate anyone who is willing to pray for us. At this point, our buyer does not want to back out; she is confident the problem will be fixed (as is our realtor and Chris). Mostly I think I’m the only one who’s getting an ulcer over here. Our buyer actually stopped by the house on Saturday since she saw our car in the driveway, so we got to talk to her for a few minutes, which was a good thing. It reminded me that she is a real person, not just the negotiator on the other side of the contract who is getting our house for a steal plus all of our brand-new appliances which we (stupidly) wrote into the seller’s disclosure instead of using them as leverage. It took me a while after moving here before I realized that I needed to start praying that God would use our house to bless another person and meet their needs – not just ours. Our buyer is a single woman with two college-aged kids who just got told she had to leave the apartment she was renting because it changed landlords. I still feel that this house would bless her, too, so I am trying to stay confident that God will see this through. I won’t be back until Friday, mostly because I’m joining the Favorite Things Party at 320 Sycamore and even though I feel overwhelmed, I loved participating last year and I don’t want to miss it. So I’ll see you then, and hopefully with good news! P.S. My blog is under construction, so bear with us while things get switched around temporarily! Now before you think I’ve been counting calories like a crazy woman, you should probably know that I randomly got pretty sick on Tuesday night and therefore had no desire to eat on Wednesday and I think my stomach has subsequently shrunk a little (you know what I mean, right?). Anyway, I’m excited that I’m halfway to my mini-goal! 2. Although, to be honest, I totally made an allotment for my salted caramel hot cocoa on Saturday night date night. I’ve only had 3 in the last 4 weeks. That’s not that bad, right?! I seriously can’t.get.enough. Perfection. 3. I am so thankful to have the chance to attend a wonderful Moms group in this area. On Friday, I got home and started changing Luke’s diaper and realized the nursery worker had put it on backwards. I’m not complaining; I actually think it’s hilarious. But seriously, we’ve all done it at least once! 4. This is the last week of big-time stress for the house. Our buyer has until Thursday to get her inspections completed. Septic passed (thank God!) and she’s just waiting on the water. Assuming that the water passes, we’ll be heading to PA this weekend, just the two of us, to have a hard-core packing weekend. I feel major mom-guilt for leaving Luke with my parents, but it is just a million times faster if we don’t have to worry about being quiet for his naps and bringing his special food, etc., etc. Friends are coming to help us pack, but we’re not going to church or spending time visiting or anything. It’s a “git her done” type deal. (That’s my three years of living in NEPA for you! hahahahaha) Hopefully we will be able to get the whole house done, and then when we return for Thanksgiving weekend all we’ll have to do is load the boxes into the U-Haul and then CLOSE on the 29th! I keep having recurring dreams/nightmares about the house and buying our next one. I will be sooooooooooooooo happy when the 29th has come and gone! Of course, there’s always Carrie’s advent calendar, which is also ridiculously fabulous. I can’t decide which one I like better! P.S. If you’re not reading Buzzings of a Queen Bee, I strongly recommend that you do. Carrie has exceptional taste and creativity – her blog is one of my absolute favorites! A few months ago, while looking at my Ballard catalog, I saw the cutie-pie little tree that you see below on the right. On that particular page, two of the mini-trees were flanking a mantle and I knew that at some point I would want to make a knock-off version for Christmas. Unfortunately, that catalog page is still in the office of our house in PA, but you get the idea. Here’s some tips if you want more info. 1. Paint your base – this will help later to hide your gaps. I just took black paint and mixed it with brown to make it a little more green. 3. I personally made a ring around the whole bottom (using all #1s) to see how far they would stick out, and then I went all the way up one side. Keep poking and adding and poking and adding. Remember that you’re making a tree, not a bush, so you want there to be a gradation. 4. As you get near the top and your pieces get shorter and shorter, you’ll probably want to start hot-gluing them onto the tree. I would poke a hole with the toothpick, get 2 or 3 of the shorter branches together, hot-glue the end, and then stick it into the pre-made hole. At the very top of the tree, I just hotglued them all (no holes). And here she is! How cute is this?! And just to keep it real after my last post, here’s where my girl is residing until we actually move: on my sister’s dresser, in front of her collection of Coach boxes (for the record, I own not a single Coach item *cough* Santa *cough*) and near my jewelry, nail polish, and perfumes. SO cute and Christmasy, right? You know the drill. We’re all human, and 99% of the time, we’re looking forward to the next big event. When you’re a kid you just want it to be your birthday, when you’re a teenager you want your license, when you’re dating you want to be married, when you’re married you want to have your first house, and on and on and on. I think almost everyone struggles with this or else we wouldn’t hear so much about living in the moment and embracing today and finding contentment, etc. etc. These last few months of transition in our lives have been really, really challenging for me. In the middle of May we were pretty contentedly living our lives in our own house in Pennsylvania, and by August 15th, we were in a new state, Chris had a new job, our house was on the market, and we were living with my parents. Live had totally, utterly flipped. And so here we are. We’ve lived with my parents for two months and 19 days. Our house is under contract, and barring something horrible with the inspections (please pray if you think of us), will be sold on November 29th, God willing. We will start looking for a house after that, but the search could take months. Even if and when we find a place, we’ll need to paint and clean and do who knows how many other repairs. I didn’t get to decorate for the Fall or Thanksgiving (my favorite season and holiday). I don’t get to hang up stockings this year or pick out my own tree or put up the Christmas decorations. We don’t get to have a private Christmas morning with just the three of us. I’ll have to wait another whole year for those moments to happen again. But you know what? Even though I’m missing out on decorating for the holidays and I’m smooshed in my sister’s old bedroom with everything the three of us own, and even though we have little privacy and even though we’re waiting with uncertainty and have no idea how long we’ll be here or where we’ll end up living, God has opened my eyes to see this time as the gift that it is. The gift of time with Luke. I definitely do my part to help around the house, and I cook dinner most nights for my family. But at the end of the day, I’m living in a house with 4 other adults, and there just simply isn’t as much to do to maintain it. I’ve been given the gift of less to do, which in turn has made me appreciate the gift of my son so much more. I have not been shy on here about how hard Luke’s first months were on me. A number of you e-mailed me after that post and shared your own struggles with motherhood and expectations. It was wonderful to share my heart and know that there were others of you out there like me. I am here to tell you – and encourage you - that I enjoy my son in a whole new way now. Since I haven’t had as much to do, I have had the chance to just be with him. I sit on the floor and play with him now without thinking about all of the million other household tasks that have to be done. I still get my work done, but with so much more open time I’m free just to play blocks or tickle or kiss his sweet toddler-face. Part of this enjoyment is due to the fact that he’s growing up. He’s a lot more interactive, which is incredibly fun. But part of it is due to the fact that God has graciously opened my eyes to the moments that I might be missing out on otherwise. So yes, I’m typing this post on my sister’s bed, surrounded by all of her things that she didn’t bring to college, empty suitcases of ours, and three laundry hampers that have to stay in our small room since there’s no room downstairs. I may not have a ton of privacy, and I may not be cutting down a Christmas tree in the next month. But I am building priceless memories with my boy. I have fallen in love with him all over again. I dream about moving to my new house all.the.time, but I can honestly and truly say that I am thankful for the way that God has opened my eyes to what could have been a missed opportunity. I want this lesson to go on with me to our next house. Time with Luke is precious and fleeting, and I want to make the most of every opportunity. I literally thank God for this transition. 1. It’s November. IT’S NOVEMBER! There is frost on the ground today. I feel like it was just August a second ago and now I blinked my eyes and we’re here. November means the arrival of my most favorite holiday (that’s Thanksgiving in case you weren’t sure. lol). Cannot.wait. I saw that the tag said size 5 and I knew they’d never fit, but they looked adorable and just what I’d been looking for, so I went up and down the aisles looking for them with no luck. Finally I decided to just squeeze them on to see if I semi-liked them before I asked an associate to find me one in my size. You guys, they fit! I am normally a 6 1/2 or 7! And these fives are a little roomy! On further inspection I noticed that the tag said “girls,” and sure enough, there were TONS of them in the girls section! 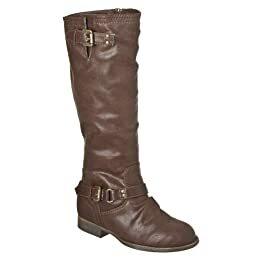 Best of all, they were originally $24.99, on sale for $22! I just couldn’t wait for Christmas. I thought about it for like 5 seconds, but I had money from teaching music lessons so I bought them myself. Oh mylanta, do they make me happy. 5. I gained 4 pounds since I’ve been here at my parents’ house. Four pounds in less than 3 months. Yowza. There are a multitude of reasons why this is, but bottom line is that I DO have control over what I eat and I need to just own up to that. I’ve made it my goal to lose 4 pounds before Thanksgiving. Just one measly pound a week. I really think I can do this! Anyone else want to drop a few pounds before the holiday? Let me know and we can encourage each other. I will check back in next week and let you know how I did. (Whew, how’s that for accountability?! ).